Great first at the Four Seasons George V where SommelierS International had organized a prestige tasting “special spirits”, gathering together sommeliers, of course, but also barmen and cellarmen, to offer the producers the opportunity to see some of their products flirt with mixology. At the heart of the most elegant district of the French capital, between the Champs-Elysées and the banks of the Seine, the George V is one of the most sumptuous Parisian hotels. This jewel of the luxury hotels has been decorated by Pierre Yves Rochon when taken over by the prestigious Four Seasons group. It welcomes important visitors as well as unknown persons of the whole world in one of the most majestic lobbies imaginable, opening on the magnificent “Marble Courtyard”. Its sobriety and elegance inspire calm and serenity. This beautiful setting is further enhanced by splendid decorations and amazing floral sculptures designed by talented American florist Jeff Leatham. But the real asset of this hotel is the exceptional quality of its service, mindful of the slightest detail while remaining discreet, making it one of the most renowned establishments of the planet. For this Prestige day dedicated to spirits, the tasters met at the Foyer Vendôme early in the morning. Considering the quality and diversity of the presented bottles, SommelierS International had decided not to limit the audience to sommeliers and had also invited for the first time barmen and cellarmen. A great selection of 148 cuvees was awaiting them: Armagnac, Cognac, Calvados, Marc de Champagne, Ratafia, Port, Vermouth, Absinthe, Geneva, creams and liquors, fruit brandies, Rum, Vodka, Gin, Whisky and Tequila … stemming from 52 houses. The event was co-chaired by Paolo Basso, 14th Best Sommelier of the World, Jean-Luc Jamrozik, president of the Association of Sommeliers of Paris, and Guy Musart, president of the Association of Barmen of France. The tasting took place in the Foyer Vendome, where the bottles were displayed all around the room and the tasting tables aligned in the centre. All morning long the tasters worked by tables of 4 people for a collegiate valuation, a single comment being written for each cuvee. Arc International, partner of the A.S.I., supported the event and gracefully provided two models specially selected from its range of glasses Open Up Spirits dedicated to the tasting of spirits: Warm, a tumbler of 30cl total volume including 7 cl till the angle, mainly intended for whiskeys and rums; as well as Cool, stemmed glass of 11cl total volume, 4 cl till the angle, perfect for concentrating the aromas of fruit and rice brandies, liquors, absinthe, vodka, gin, mescal, tequila, etc. Once the tasting ended, the professionals were joined by representatives of the various houses that had submitted their samples to the experts’ palate. As a prelude to the lunch, an aperitif has been served in the Salon Chantilly, where two partners of the event awaited the guests in order to delight their taste buds. Izarra had entrusted the live careful elaboration of the Basque Mojito, a great classic revisited by the Green Izarra to Norman Lenoble, bartender of the Buddah Bar... Wonderfull! For its part, Lixir, a company specialized in the marketing of spirits and Champagne on the French market, was offering the festive bubbles of the cuvee Piper-Heidsieck Brut 2006. Then the lunch took place in the luxurious setting of the Salon Vendôme. The Chef had concocted a fabulous menu, equal to the event: cocktail of melon and watermelon with peppermint and vegetal Panini; then Veal Marengo with marjoram, gnocchi and brown mushrooms in ricotta; and finally a Lemon pie, crisp Gianduja, coconut meringue and yuzu sorbet. These dishes were splendidly accompanied by the aromas of Joÿ Attitude, a charming exotic dry white wine 70% Petit Manseng and 30% Colombard, made in Gascony by Olivier and Roland Gessler, partners of the lunch like the company 1000Vins managed by Philippe Jury, a wholesaler proposing 3.000 references, who had chosen for the occasion a red wine: Gevrey-Chambertin 2010 from Philippe Charlopin, and a white one: Saint-Aubin 2008 from Alix and Etienne de Montille. Stéphane Serre of Domaine de l’Amandyère had also had the thoughtfulness to put a bottle of his cuvees Elliptique 2009 and Anoblie 2011 on each table. After the coffee and the petits-fours, the audience grouped together in the Foyer Vendôme for the traditional producers-tasters meeting. The afternoon gave the opportunity to the Houses to approach the personalities for a privileged private conversation, a live tasting comment and constructive exchanges. 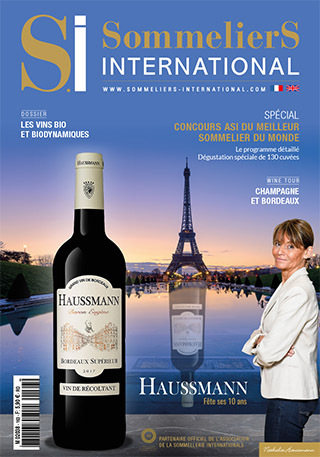 SommelierS International deeply thanks all the participants in this memorable day devoted to sharing and conviviality.